Concrete Renovations Inc. is now providing concrete grinding services in Connecticut (CT), Massachusetts (MA), Rhode Island (RI), Vermont (VT), and New Hampshire (NH). 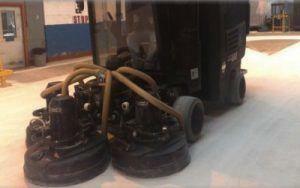 Concrete grinding is the quickest way to fix your concrete flooring imperfections or to prepare for concrete coatings. Whether you’re dealing with an unlevel floor, cracking, chipping, peeling, crumbling or just a horrible looking concrete finish, grinding is the most affordable way to repair a damaged ugly concrete floor. When you think of concrete grinding, you think of just a cleaner version of your old floor, but things have changed. Now you can literally make your floor look like decorative expensive tile and even solid stone with the right combination of grinding, diamond concrete polishing, and concrete coloring. Concrete Renovations Inc. is the most affordable grinding professional in New England, and we are more than happy to come out and give you a free expert analysis of your concrete grinding and diamond concrete polishing needs. For more than five decades, concrete scarifying and shot blasting machines have served the purpose of creating a unique floor. Many believe that these methods are the best way to machine a floor, but it’s time to consider the growth of other machines, techniques, and tools. The development of tools and machines around the globe have kept up with advancements and save time and money when modern equipment is used by contractors. 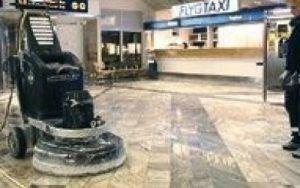 Concrete grinding works on all surfaces and a magnificent surface is always achieved. Grinding gets close to edges with little dust or noise. Scarifying or shot blasting, on the other hand, can leave lines underneath the covering requiring extra covering material. There might be a high level of noise and dust and might not have the ability to treat the full area. Flooring is one of the first things your customers’ notice and most of us know first impressions count. Concrete grinding leaves your customers feeling excited to enter your business. It also increases your employee morale. Concrete Renovations Inc. takes excellent care and uses our experience each step of the process. Whatever your needs are we have the option for you.